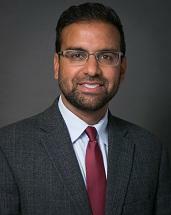 Tariq's expertise is in the areas of business and corporate law, healthcare law, and commercial and civil litigation. As a result of his entrepreneur background, he enjoys advising small business on a variety of matters including corporate formation, governance, sale/purchase of assets, and acquisitions. Tariq is increasingly focused on providing legal counsel to health care related businesses including physicians' practices and home health care providers. Over the past 10 years, Tariq has worked at a large corporate law firm based in Detroit and has also served as a prosecutor with the Michigan Attorney General's Office handling hundreds of cases, pre-trials and trials in courts throughout the State. He received his undergraduate and law degrees from the University of Michigan. Tariq is married and the proud father of three beautiful girls and a son. He gives back to the community through his service on the Board of the Crescent Academy International, a private school in Canton, MI. A born and raised Michigander, Tariq loves Michigan's outdoors and enjoys running, biking, and camping.